I don’t understand the fascination with shooting at signs. Would it be wrong of me to speculate that beer is involved? I decided to keep it simple and easy, inasmuch as the ankle is still healing and both Cindy and I are still feeling cautious about the thought of me out in the wilds. I would visit the Galisteo Dam, which is located in an area of interesting geology and which my topo map claims has a picnic area on its south bench, then drive Waldo Canyon Road to admire the Cretaceous beds, do an easy hike on one of the busy and well-maintained trails at Cerillos State Park, then drive a little south of town to try to spot an interesting contact in the road cut. 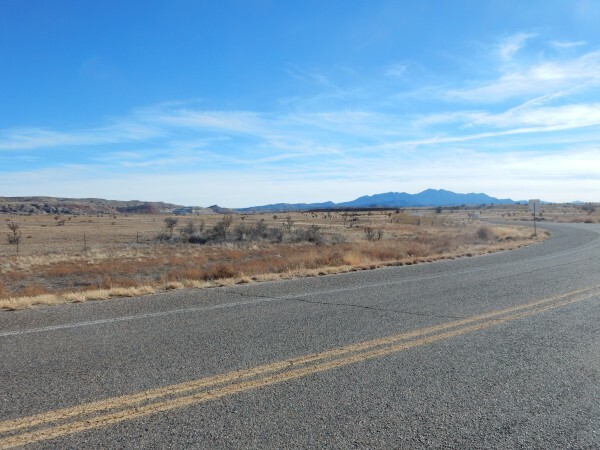 The whole route would be on well-maintained paved or gravel roads under good cell phone coverage, so I would take my new cell phone and leave the SPOT beacon at home. The latter requires a subscription service which costs $150 for a year which must all be paid up front, and Cindy preferred that I put that off until it was really needed. I keep an eye out for new things even when I’m driving very familiar ground, because sometimes the light is just right to spot something you haven’t noticed before. 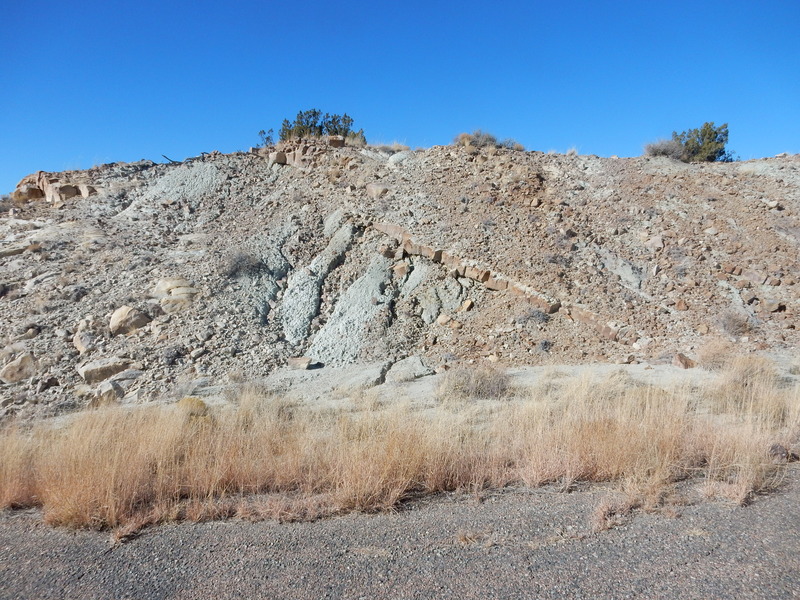 This happened on the road from Otowi to Pojoaque, where I spotted what I thought might be a contact in the Santa Fe Formation underlying the hills along the road. Notice that the top of the hill is distinctly redder than the lower slopes. The geologic map confirms that this is the contact between Lithosome A (on top) and Lithosome B (at bottom) of the Pojoaque Member of the Tesuque Formation of the Santa Fe Group. Let’s unpack that. 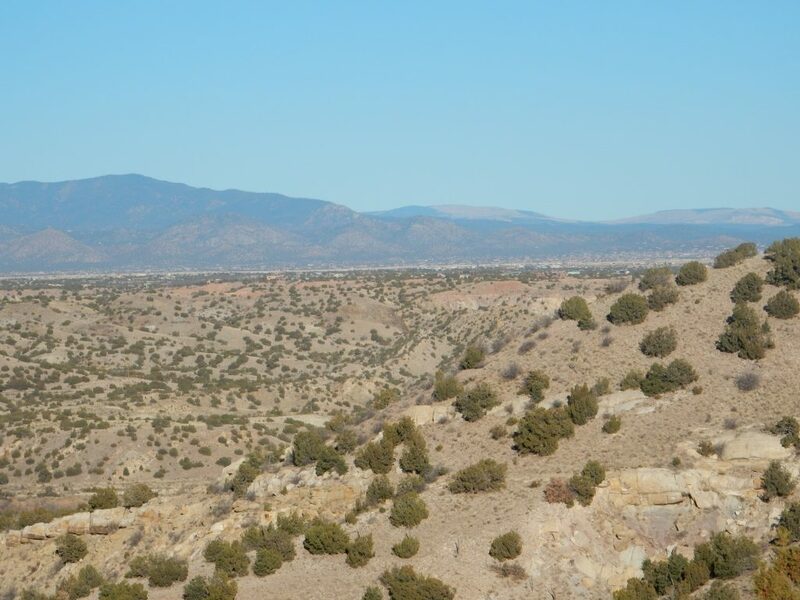 The Santa Fe Group consists of the rift-fill sediments of the Rio Grande Rift, the great crack in the Earth’s crust that reaches from central Colorado to El Paso and more or less coincides with the Rio Grande Valley. The Rio Grande Rift opened about 30 million years ago and is probably still slowly widening. Sediments eroded off the nearby mountains filled the Rift as it opened, except that quite recently (in geologic time) our region became elevated enough that the Rio Grande began eroding out the rift fill sediments, producing badlands in which the beds are now well exposed. 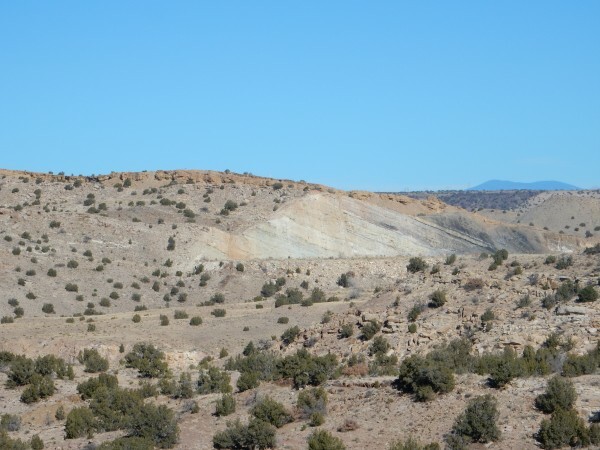 The Tesuque Formation is the main formation of the Santa Fe Group in our area, reaching from Taos to just south of Santa Fe. It is between 20 million and perhaps 5 million years old. (Some beds have been very precisely dated, but the oldest and youngest are more uncertain.) 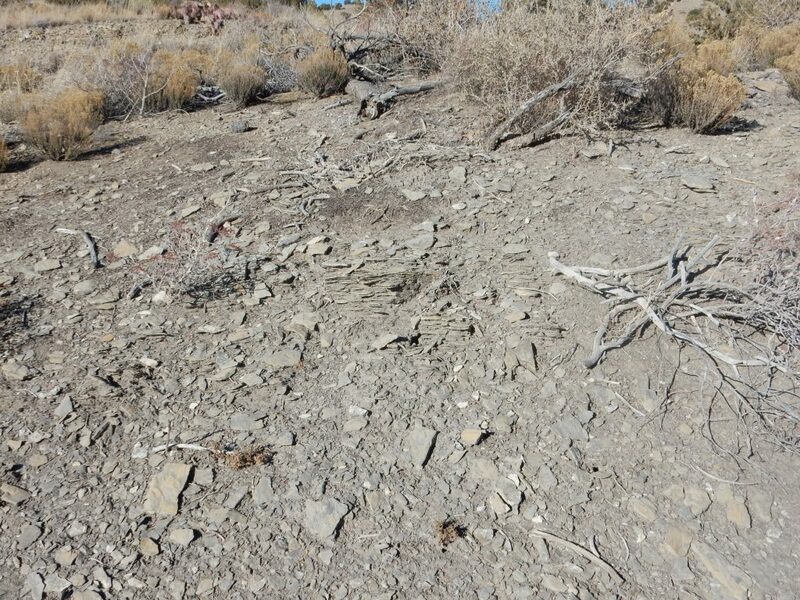 It all looks like brown dirt to casual observers, but geologists have come up with a rather intricate terminology for the various beds of the Tesuque Formation, which interweave divisions in time (formal geologic members of the formation, such as the Pojoaque Member) with divisions by source of the sediments (lithosomes.) So this particular hill is part of the Pojoaque Member, representing a particular time period of sediment deposition, but the source of the sediments shifted between the top and bottom of this hill. The bottom is Lithosome B, which is clay-rich sediment containing pebbles that appear to have eroded off mountains to the north and northeast. The top is Lithosome A, which contains less clay, more grains of pink feldspar, and is thought to have eroded off the granite ranges of the Sangre de Cristo Mountains to the east. 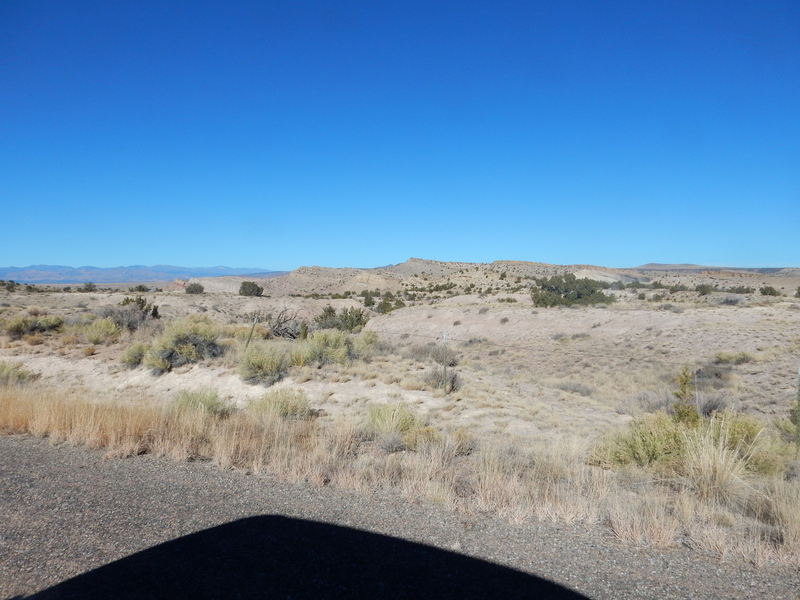 I didn’t spot anything else particularly new until I reached the turnoff to the Galisteo Dam. This is the only area I’m visiting today that is completely new. You take the Cochiti exit of I-25, but you go south instead of north. 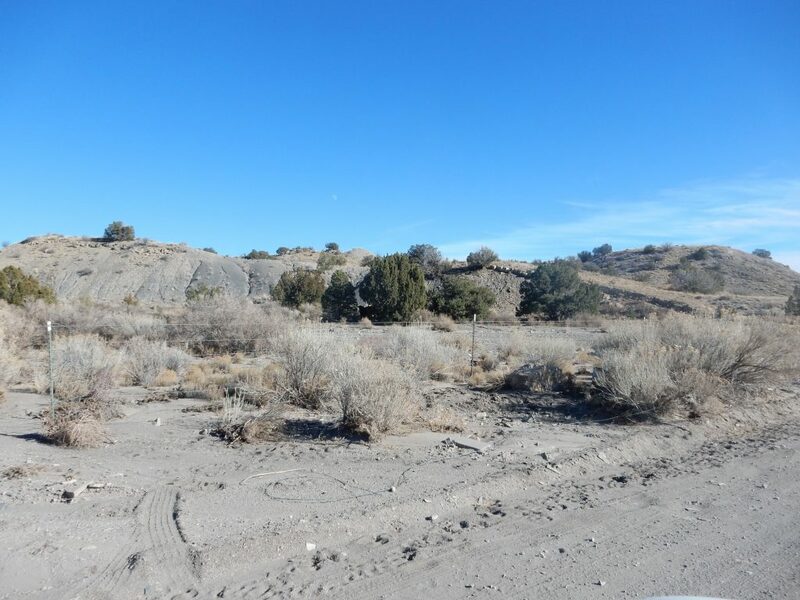 The road passes the spur to the Rosario gypsum mine, which I did not plan to visit, since I feel uncomfortable ostentatiously photographing the rocks around an active mining operation without advance arrangements. I continued along the road to the dam, which crosses an obvious pediment surface. I don’t think this picture does it justice. 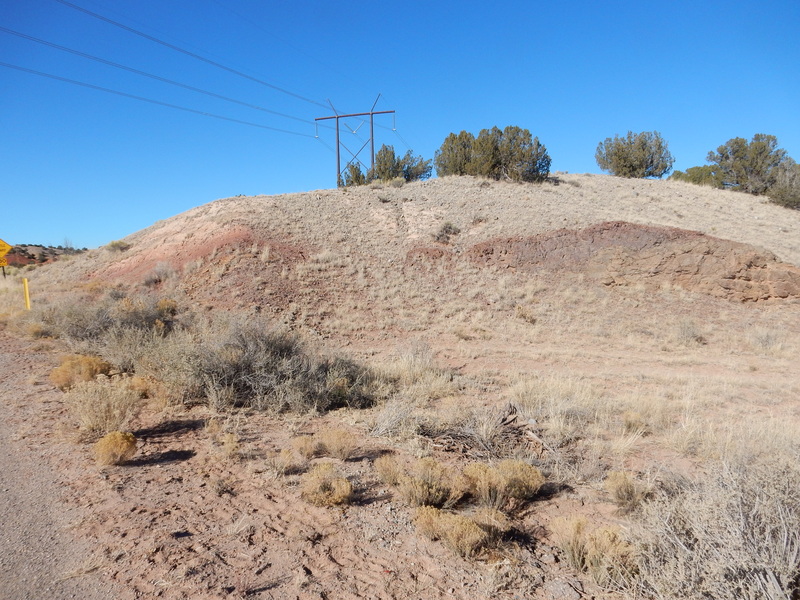 This very flat surface is the southern part of the La Majada Mesa surface, which is divided by Galisteo Creek. 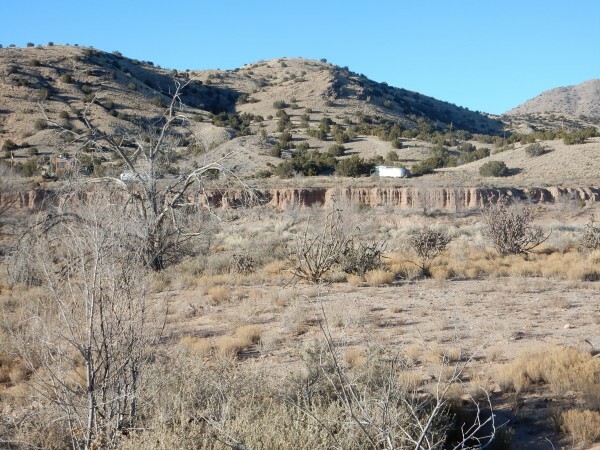 It’s a fine example of a young pediment surface, formed in an arid climate at the foot of an escarpment that is being slowly eroded back — in this case, the La Bajada escarpment, formed by the La Bajada Fault. The surface is eroded flat and becomes covered with gravel from the escarpment, which is then cemented together by caliche, the whitish lime deposit that is the sorrow of local gardeners. When a change in the local river system lowers the river bed, as has happened repeatedly in the Rio Grande Valley in the recent geologic past, the cemented surface resists erosion and forms a plateau above the river level. 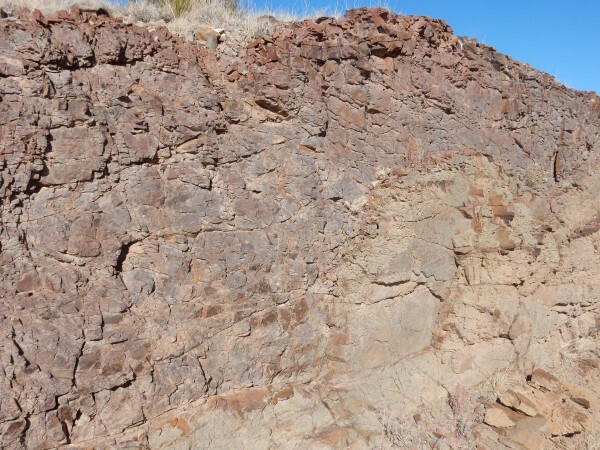 The key thing about this particular surface is that it is young, less than a million years in age (a blink of an eye in geologic terms) and is part of the Rio Grande Rift. 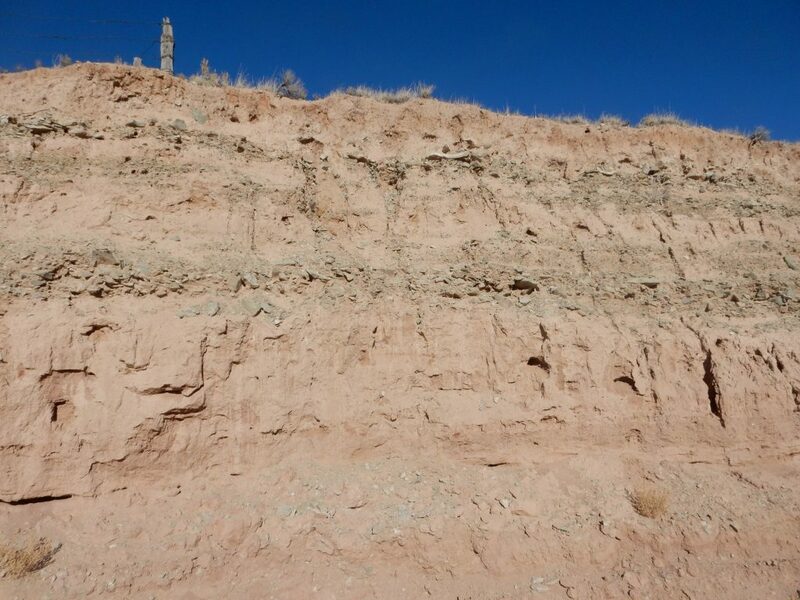 The La Bajada escarpment to the east is much older, exposing rocks from as far back as the Triassic, over 200 million years old. 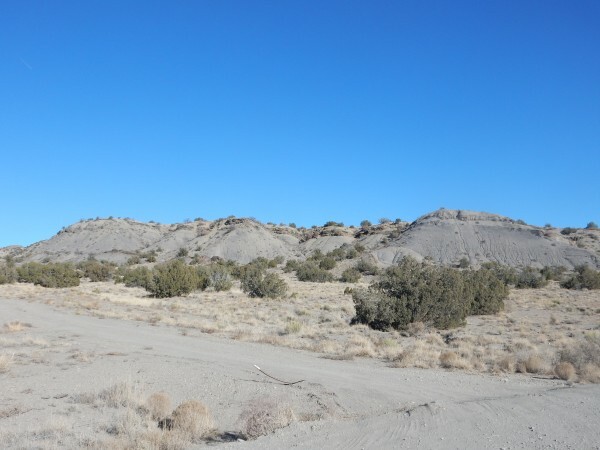 This tells us that the La Bajada escarpment, and the La Bajada Fault that produced it, are the eastern boundary of the Rio Grande Rift in this area. And that is what makes this area geologically interesting. 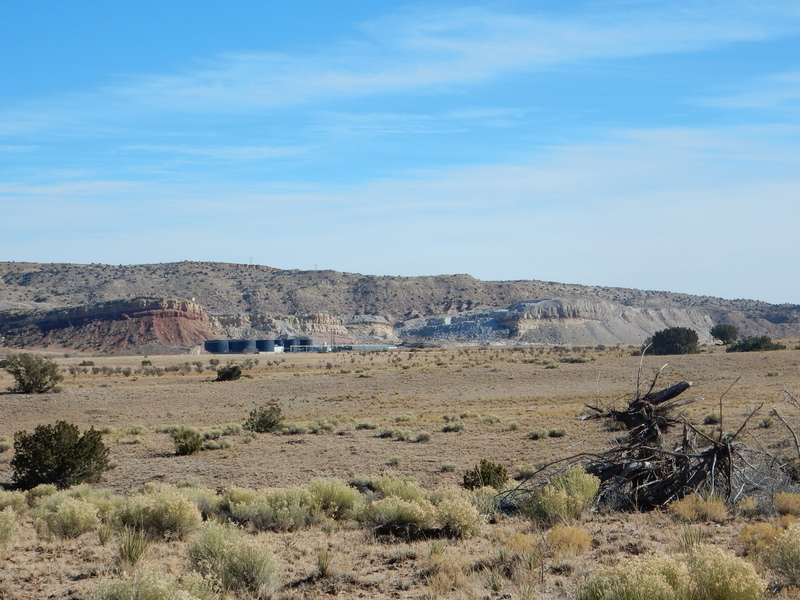 Here’s the Rosario gypsum mine, viewed from a discrete distance. 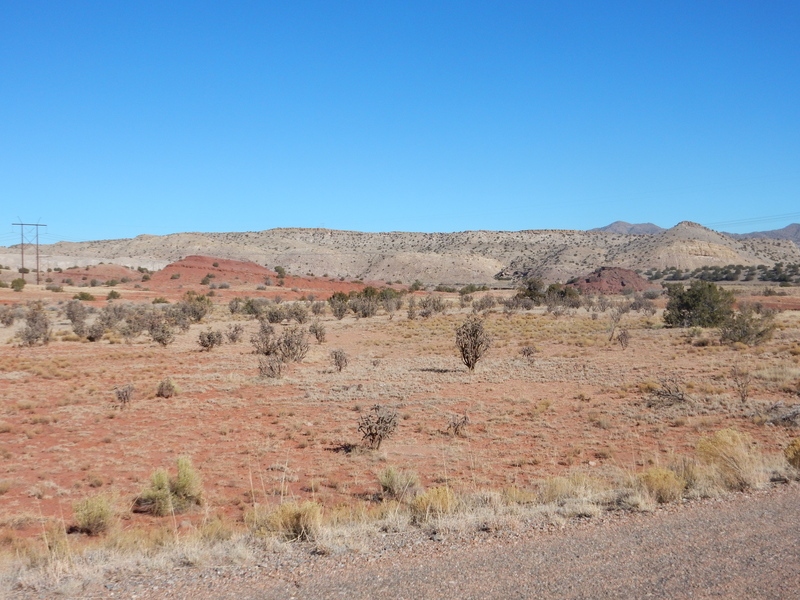 The prominent reddish slopes at left are Chinle Group, which are Triassic beds that are the oldest beds exposed in this area (a little over 200 million years old.) 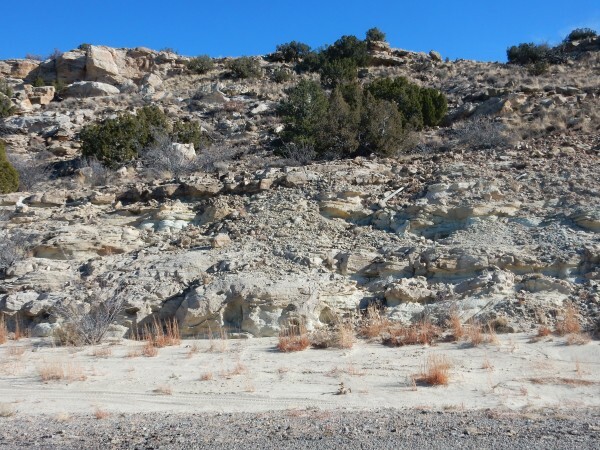 The yellowish bed forming a shelf above that is the Jurassic Entrada Sandstone, and above that are white beds of the Jurassic Todilto Formation. The Toldilto Formation is the formation containing the gypsum, and you can see that it becomes very thick to the right. This formation was laid down in an arm of the sea that drowned New Mexico at a time when this area was much closer to the equator. The evaporating sea water deposited limestone, then, as it became more concentrated, gypsum. In a few locations, salt may eventually have been deposited as well, though this has long since dissolved out of the beds, distorting them in a way that is our only clue that the salt was once present. The hills in the background are underlain by Jurassic Morrison Formation under a rim of Cretaceous Dakota Formation. The Morrison Formation was laid down in an environment of rivers and floodplains, while the Dakota Formation represents sands deposited by the return of the sea to this area. This transgression (as geologists call the advance of a sea across a continent) took place about 100 million years ago, and covered much of the western United States with what geologists call the Western Interior Seaway. The same area from a view point a little further south. You can see how thick the Todilto Formation is in this spot. This may have been a gully or other depression in the surface of the older Entrada Formation. Similar small areas of unusually thick Todilto Formation are mined in other locations in New Mexico, including San Felipe Pueblo and White Mesa. The latter two are on tribal lands and contribute to the tribal economies. Also note how very flat the pediment surface is. Further down the road is something way cool. The reddish, nearly vertical, thin line on the side of the hill caught my eye, screamed “Fault”, and I took a photograph. 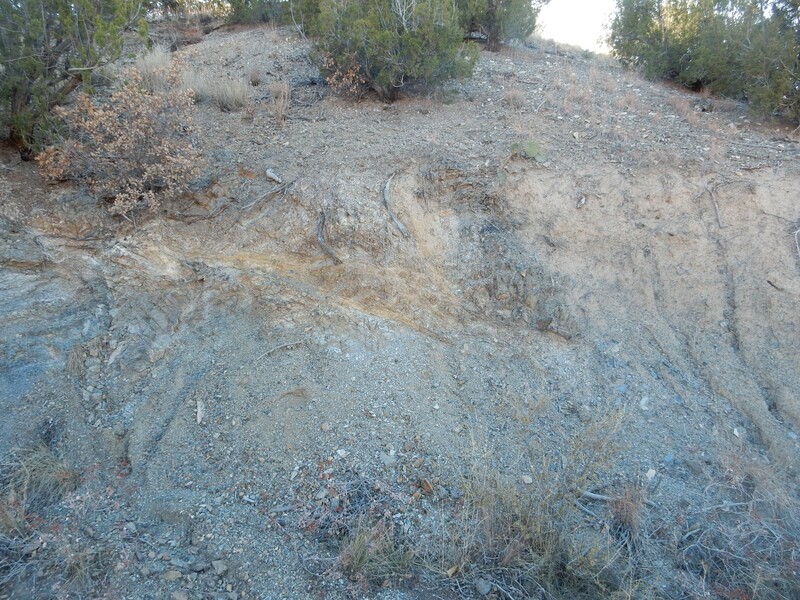 Based on checking the geologic map after I got home, it appears that this is the precise trace of the La Bajada Fault. The fault runs nearly at the foot of the La Bajada escarpment to the north and south, but in this area, Galisteo Creek eroded the escarpment back so that the fault runs some distance west of it — right through his hill, where I spotted it in the field. 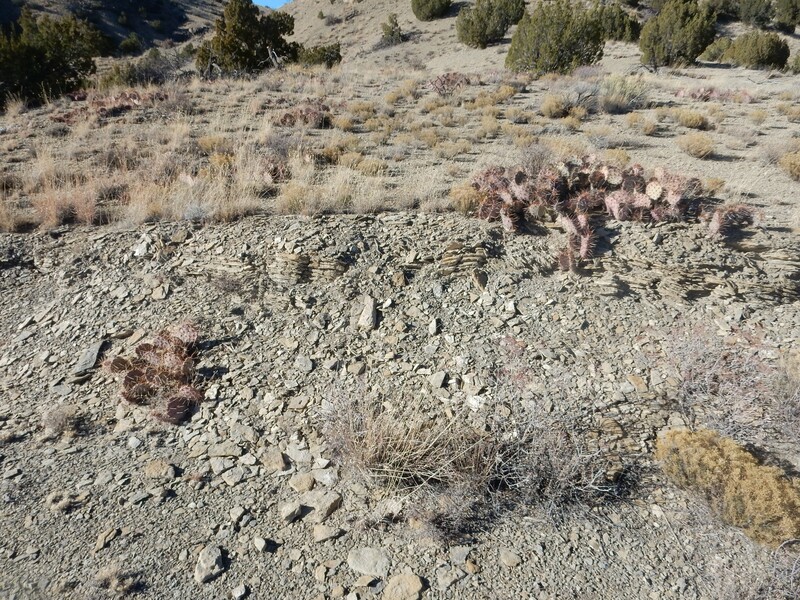 The pinkish beds to the left, on the downthrown side, are young Rio Grande Valley alluvium deposits. The reddish beds to the right are ancient Chinle Group. 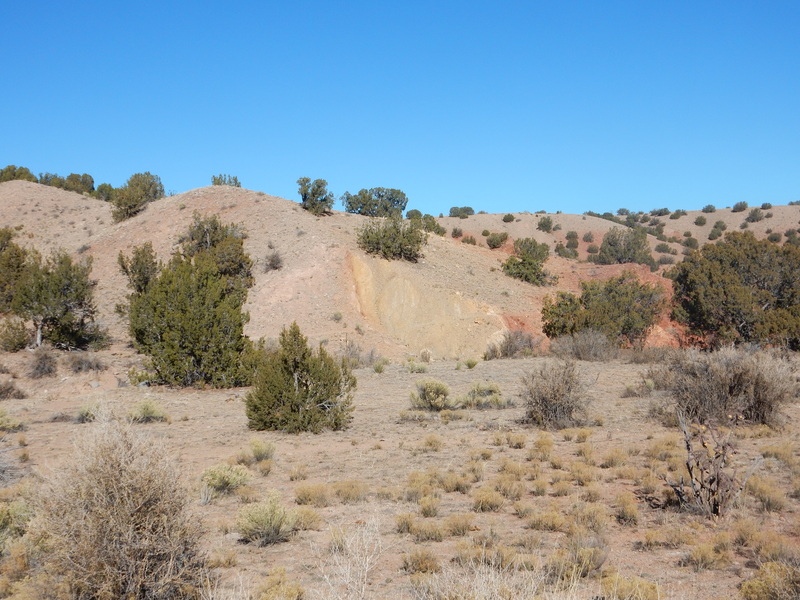 The yellowish beds immediately to the right (east) of the fault, between the fault trace and the Chinle beds, may be a sliver of Entrada Formation. 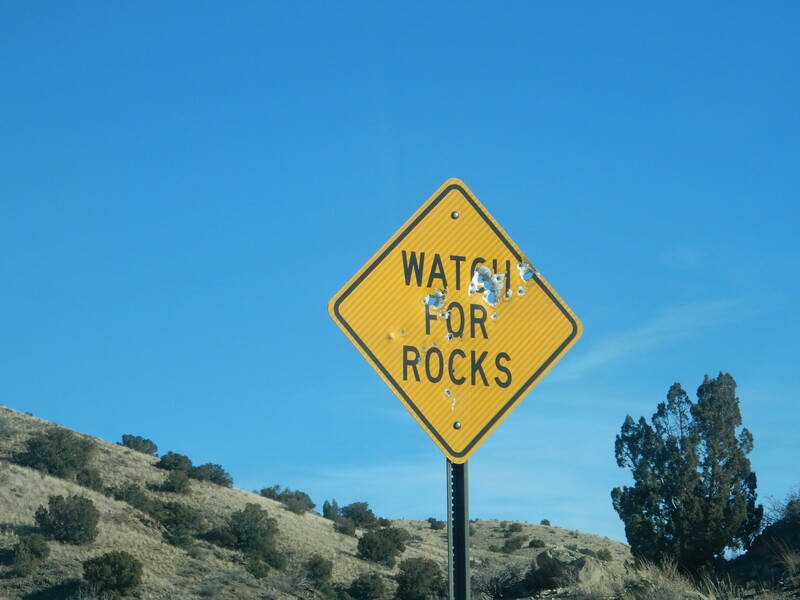 Or they may be fault gouge, the pulverized rock formed by motion along the fault, which has since been cemented by minerals brought in by groundwater flowing in the fault zone. 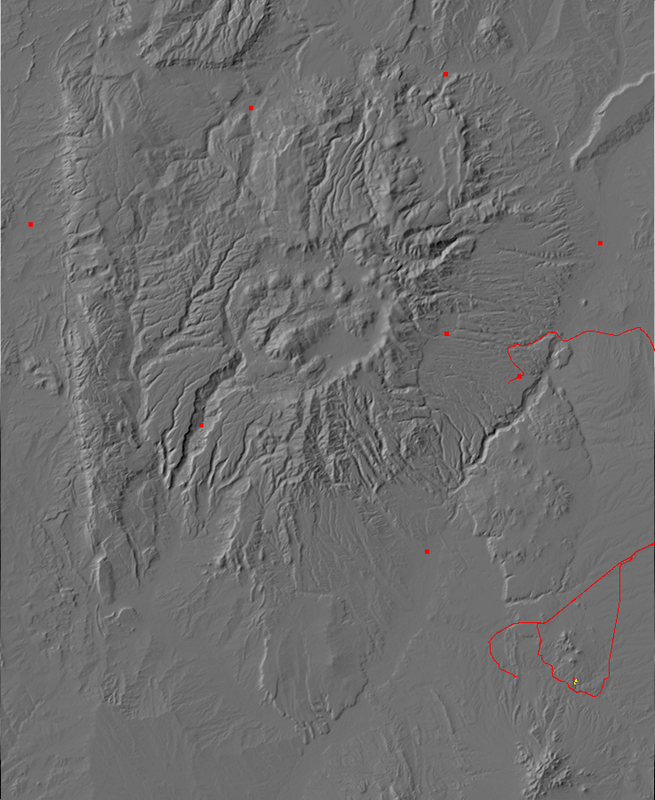 My geologic map is imprecise but shows Entrada Formation at nearby locations immediately east of the fault trace. Chinle Group between the La Bajada Fault and the La Bajada Escarpment. 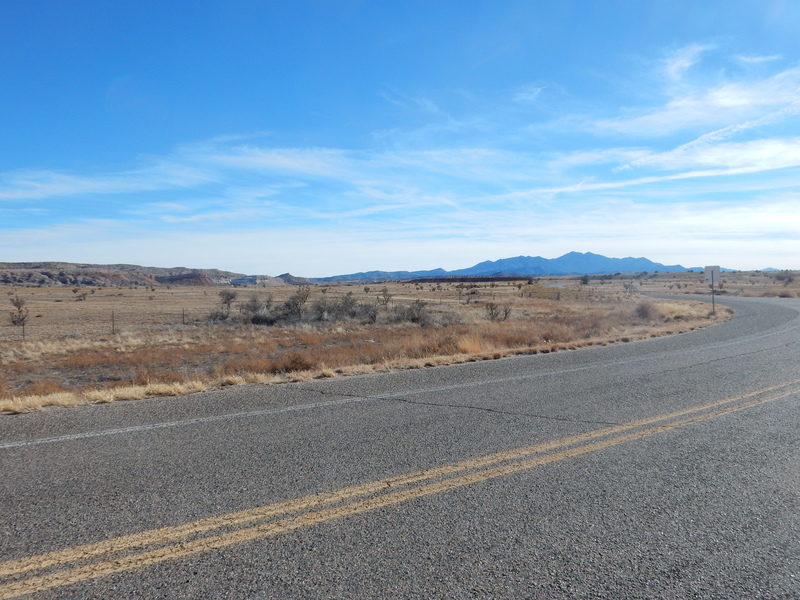 The road passes a knoll of what my geologic map identifies as Entrada Formation. The dark cap at the very top of the hill (click to enlarge) may be limestone of the Todilto Formation. From further south, we get a nice if distant view of the Dakota Formation sandstone capping the La Bajada escarpment. The Dakota Formation is widespread in New Mexico, and tends to stand out wherever it is exposed, because it is resistant to erosion. The road heads east into a road cut. Yup, that pretty much sounds spot-on. The cross bedding is not evident here, but the greenish mudstone sure is. The “kaolinitic subarkosic sandstone” is sandstone with a lot of clay and small quantities of feldspar grains in it. 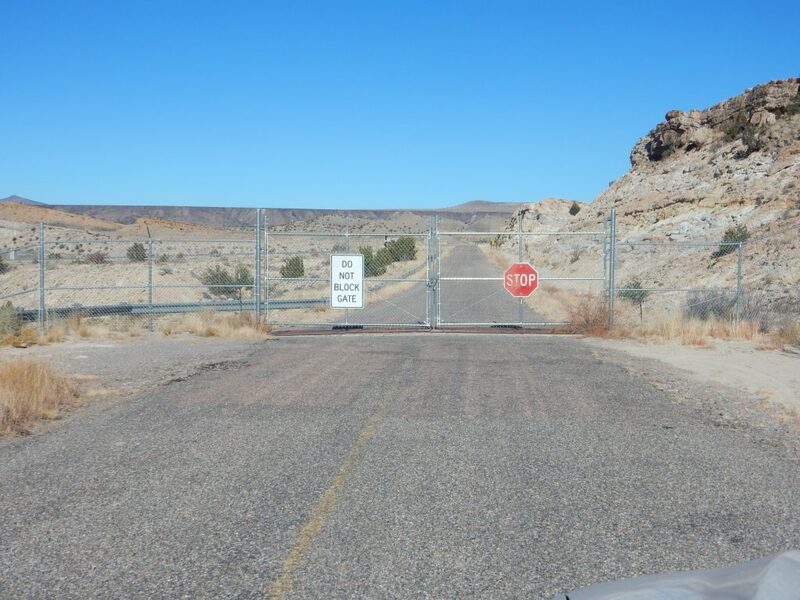 The road passes a sign: “Road closed 500 feet”. Well, I’m close to the dam; perhaps that’s simply saying the road doesn’t go beyond it. Dunno why the last stretch of road is closed. It’s not like some terrorist can send a vast wall of water sweeping down the Rio Grande Valley by blowing up the dam, nor is the dam used for power generation, as far as I know. Flood control, and rather superfluous at that. Sandstone of the Oak Canyon Member, Dakota Formation, caps the ridge, with Jackpile Member, Morrison Formation, beneath. The contrast is actually clearer in the previous picture, beyond the gate to the right. I turn around, eat my lunch in my car, and head out. On the way, I stop near a ridge crest, walk to the crest, and take a panorama. The thick Todilto gypsum bed is visible at far left. The knob at left center is underlain by the Salt Wash Member of the Morrison Formation, the only member described in my geologic map as being composed mostly of resistant sandstone and conglomerate. The slopes above are more or less evenly divided between Brushy Basin Member (mostly mudstone) and Jackpile Member, both less resistant and therefore forming a gentler slope. Incidentally, geologic unit names are taken from locations where the unit was first characterized by geologists. 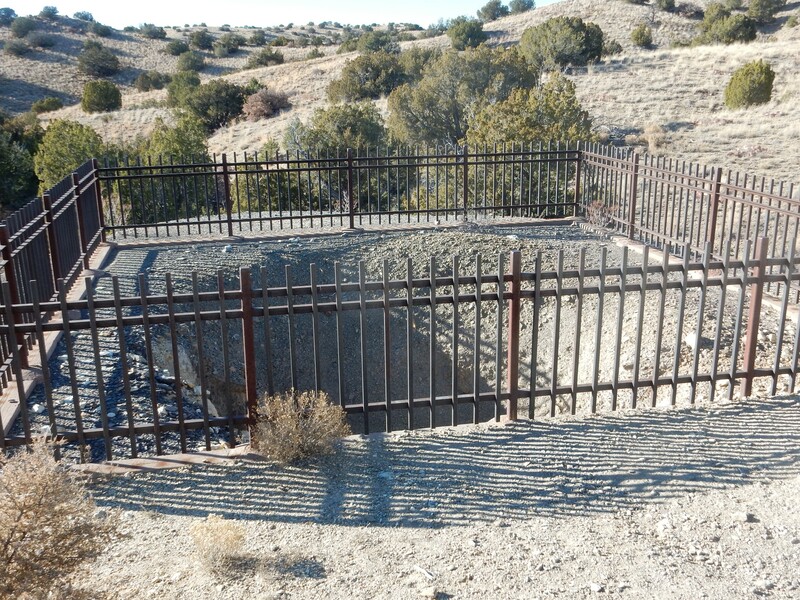 So, yes, there is a Brushy Basin, in extreme southeastern Utah, while Jackpile is the name of a mine in northern New Mexico. 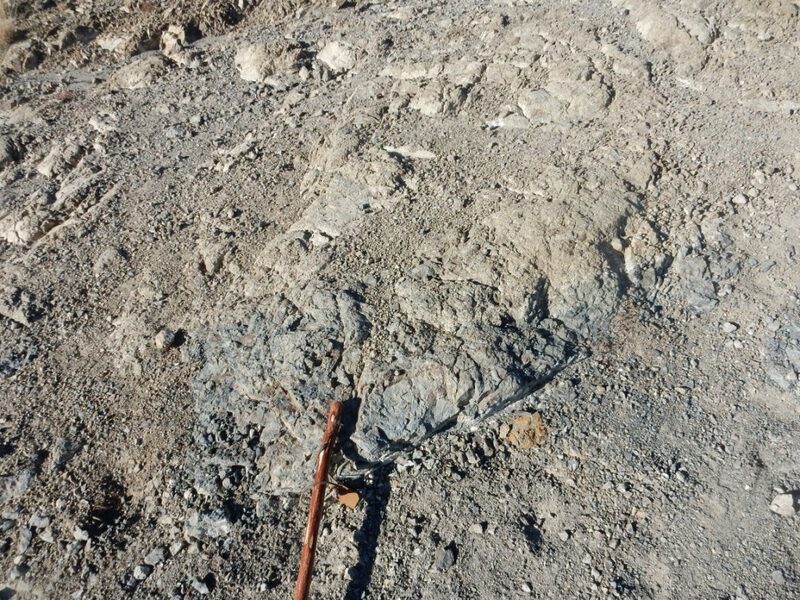 The entire thickness of exposed rock is Jackpile Member, except for a very thin rim of Dakota Formation. We’re seeing this at a highly oblique angle, which exaggerates the dip of the beds to the east. However, you can see (if you click to zoom in ) that the surfaces between Jackpile beds are fairly irregular, and the beds are at a slightly different dip than the overlying Dakota Formation. I’m not sure what the correct interpretation of the first is; it may be typical of fluvial deposits. The second tells us that the Jackpile beds were already slightly tilted and partially eroded when the Dakota Formation began to be laid down — an example of an angular unconformity separating different formations. The rock is pinkish porphyry. A porphyry is a rock with prominent large crystals (here, white crystals of feldspar; click to enlarge) in a much finer-grained ground mass. The ground mass in this dike is pink and aphanitic, meaning the grains are too fine to make out with the naked eye. I’ve never seen a porphyritic dike before. Most that I’ve seen are composed of rock quite low in silica, such as basalt, which tend not to be very porphyritic. This must be an andesitic dike, with a higher silica content encouraging the formation of feldspar phenocrysts. The dike comes in two layers, of which the porphyry is the outer layer. This photograph shows the outer layer to the right, which has eroded off the inner layer at left. The inner layer is a very fine-grained rock without any phenocrysts. I vandalized a fragment and found that it is dark red all the way through (though weathering accentuates it.) Could well be a hornfels rather than cooled magma. Hornfels is formed from silica-rich sediments when they are baked by a nearby magma body. 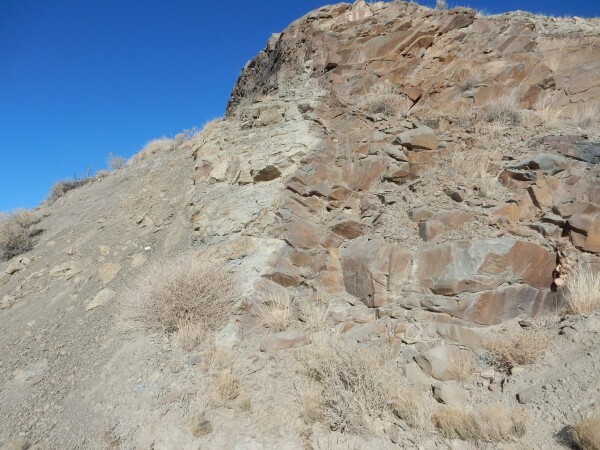 The first photograph of this dike shows a pretty substantial baked zone beyond the dike, in the road cut on the left side of the hill, so the porphyritic magma was pretty hot when it intruded. (Itself remarkable, given that it had cooled enough to form phenocrysts.) The rock looks like other samples of hornfels I’ve collected, so that’s a distinct possibility. Returned to the freeway and took the Waldo Canyon exit. The first stretch has numerous “No Trespassing” tires hanging on the fence on either side of the road (seriously: old tires with “No Trespassing” painted on them. The jurisdiction map confirms it’s private land.) I did take a picture from just outside the fence of the Cerros del Rio escarpment. The escarpment is most striking just left of center, where you see a basalt cap on a high mesa of Santa Fe Group sediments. The escarpment winds around and comes close to this location on the right side of the photograph. 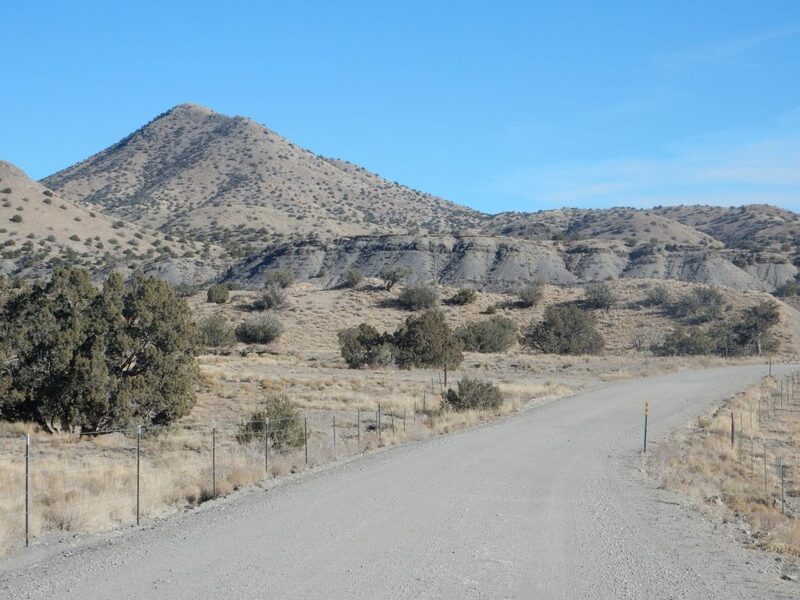 The Cerros del Rio is a basalt plateau formed around 3 million years ago by eruptions of low-silica lava along fissures associated with the Rio Grande Rift. The low silica content makes for relatively fluid lava, so it freely spread out in all directions to form the plateau. The Rio Grande now cuts through the plateau, and my home on the west side in White Rock sits on Cerros del Rio tholeiite basalt, as does most of the rest of the village of White Rock. It looks like the spot this photo was taken from is at almost the same level as the Cerros del Rio, but it is not capped with basalt and is not surrounded by a steep escarpment. The basalt flows end just to the north, and to the east, they pool against the Cerillos Hills. 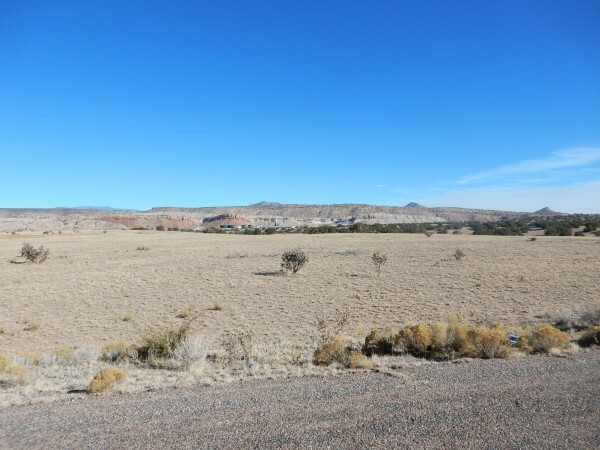 The ground here is underlain by the Ancha Formation, which is extensive south of Santa Fe and extends in patches to near the White Rock area. It is one of the youngest formations of the Santa Fe Group and is usually at the top of the rock column where it crops out. The road descents from the Ancha Formation into the underlying Cretaceous Mancos Shale, a much older formation at 80 million years of age. Here’s an example in a road cut. There’s no mistaking shale for anything else. The distinctive thin layers and dark color are diagnostic. The Mancos Shale was laid down in the Western Interior Seaway at its peak and so is marine shale. The dark color comes from a fairly high organic content, which made the bottom mud of the sea anoxic. The formation is very extensive and it has been divided into numerous local members. This is the Niobrara Member, and the geologic map specifies that this is a sandstone bed. Well, relatively speaking, it’s probably richer in sand than most of the Mancos Shale. 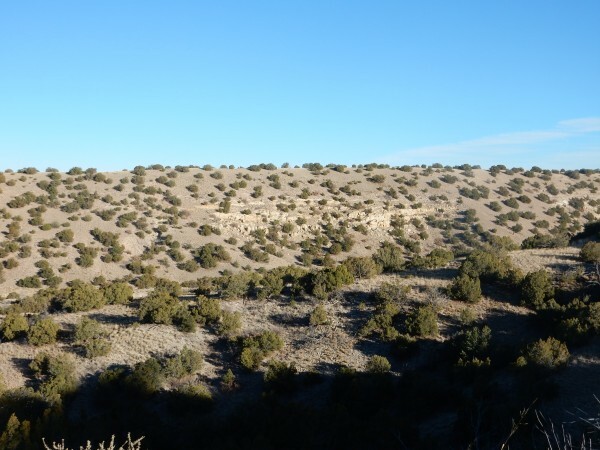 Some of the members are distinctive enough that, in some locations (such as eastern New Mexico), the Mancos is raised to group status and the Niobrara Member and Greenhorn Member are promoted to formations. 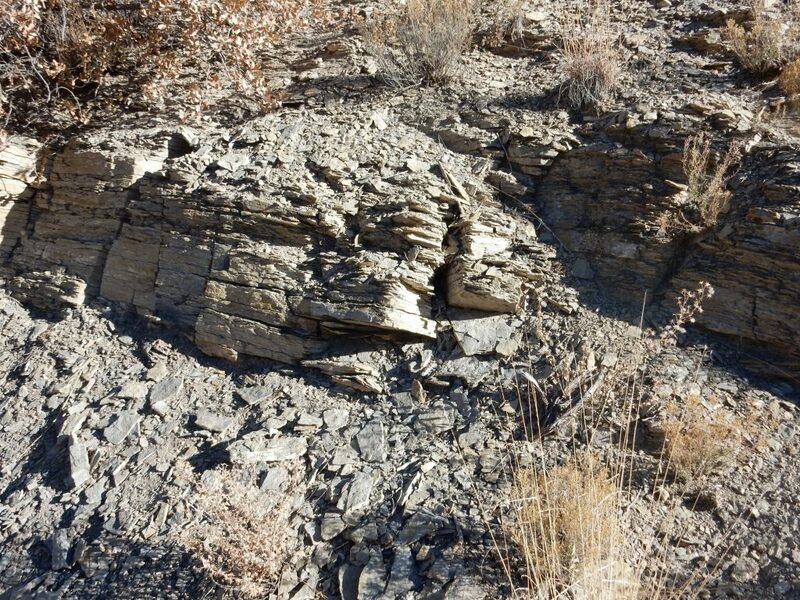 The Mancos Shale is also locally rich in fossils, particularly of ammonites (extinct cousins of the nautilus) and Inoceramus (an extinct cousin of oysters.) I have samples of both in my collection, from Mancos beds west of the Jemez. Further down the road, very dark shale is overlain by what look like dirty sandstone beds. I would have taken this for the sandstone member of the Niobrara Member, but my geologic map is definite that this is a geologically young pediment deposit on top of the Niobrara Member. Well, okay, then. I’ve been along this road once before, but I had my head buried in a road log. 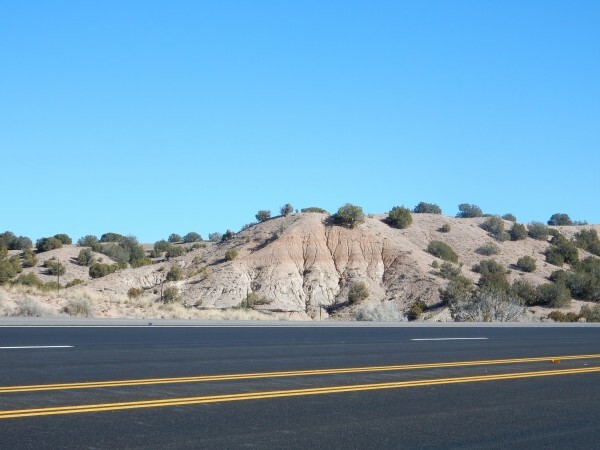 Road logs are marvelous — the New Mexico Geological Society publishes excellent ones that helped fan my smoldering interest in geology — but they tend to induce target fixation. They’re good the first time through an area; on subsequent trips, such as this one, it’s better to keep your head up and just look at the countryside. Road cut with young terrace gravels atop Niobrara Member. Ahead, another resistant bed capping shale, with the Cerillos Hills in the background. My geologic map continues to insist that this is young pediment gravel over Niobrara Member sandy beds. Here we pass a dike showing clear hornfelsization. The dike is the dark gray rock with redish patina on the right. It’s dissimilar to the dike we saw earlier, being nonporphyritic, and probably formed from more silica-poor magma. 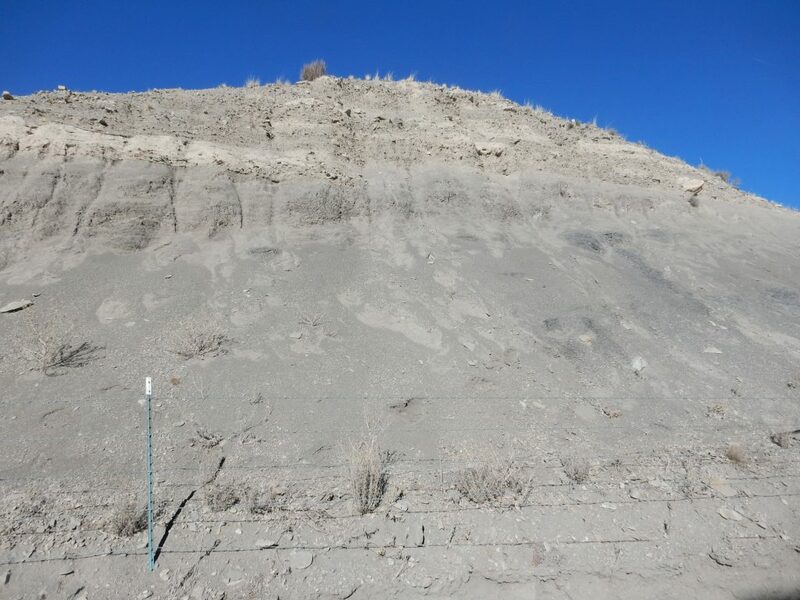 The whitish zone immediately to the left of the dike is hornfels, produced by the dike baking the Niobrara Member shale; close to the dike the shale layers have more or less fused together, while further out, the hornfels gradually transitions into unaltered shale. I already have a nice hornfels sample, and this dike is on private land, so I took no sample here. In fact, I took no samples all day, because my entire route was either on private land, tribal land, or state park land. Young alluvium in a road cut. This is mapped as mixed alluvium and colluvium, but it looks like typical river deposits (alluvium), with thick clay beds that probably represent floodplain and gravel representing the main channel of the river. Since rivers meander over time scales of thousands of years, you get gravel during times that the river meandered over this spot and clay during times when it was some distance away and clay was deposited during annual floods. And the river is Galisteo Creek. It’s a very insignificant river nowadays; the deposits here probably date to the last Ice Age, when the climate locally was probably a lot wetter. 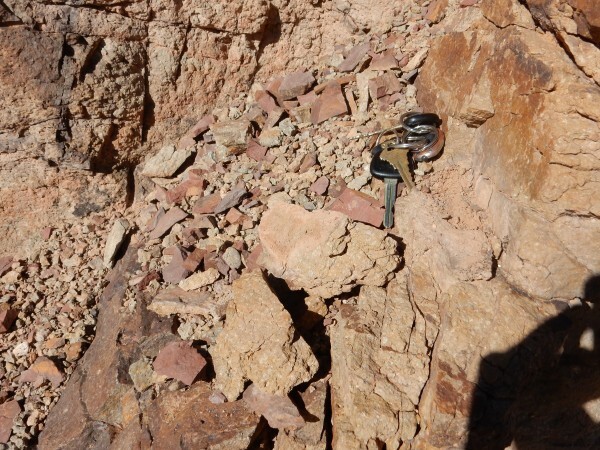 This is an intrusion of andesite porphyry, according to my map, which duly notes that one team of investigators classified it as hornblende quartz latite porphry and another as hornblende monzonite porphyry. 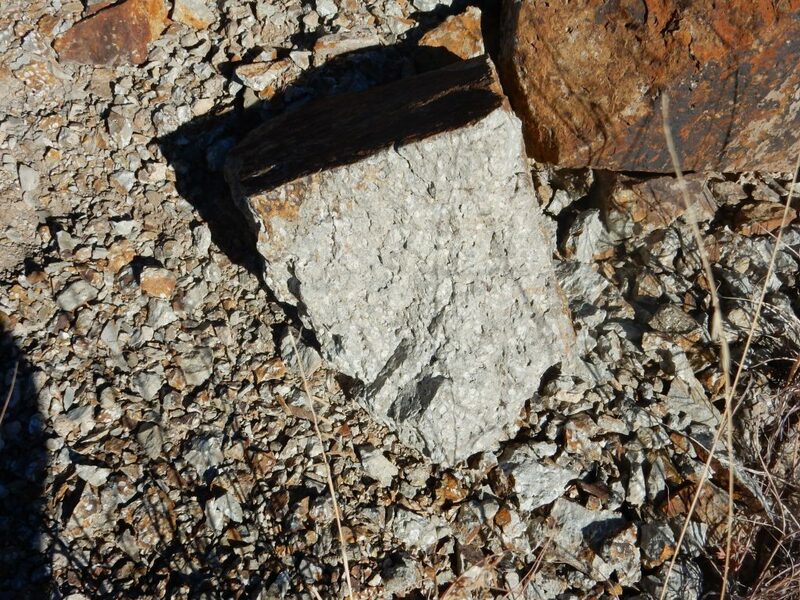 The difference is subtle: Latite has a relatively high potassium feldspar content while monzonite has a mixture of calcium and alkali feldspar. A good petrological laboratory could settle the issue, but then it’s entirely possible the composition varies from location to location. Andesite porphyry is the main rock type of the Cerillos Hills, of which this is the southwestern outlier. 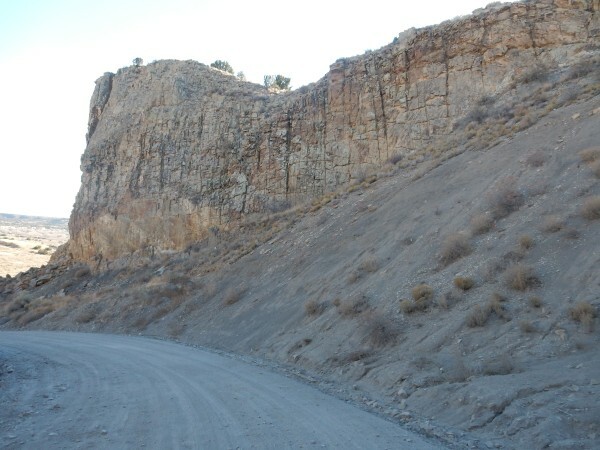 Nearby cliffs, showing Mancos Shale eroding off the face of the andesite porphyry. You see no sign of alteration of the shale. The geologic map notes that the baked contact zone around this andesite porphry is typically very thin. This suggests the andesite magma was relatively cool and free of volatile gases when it intruded, or else the shale is unusually good insulation. 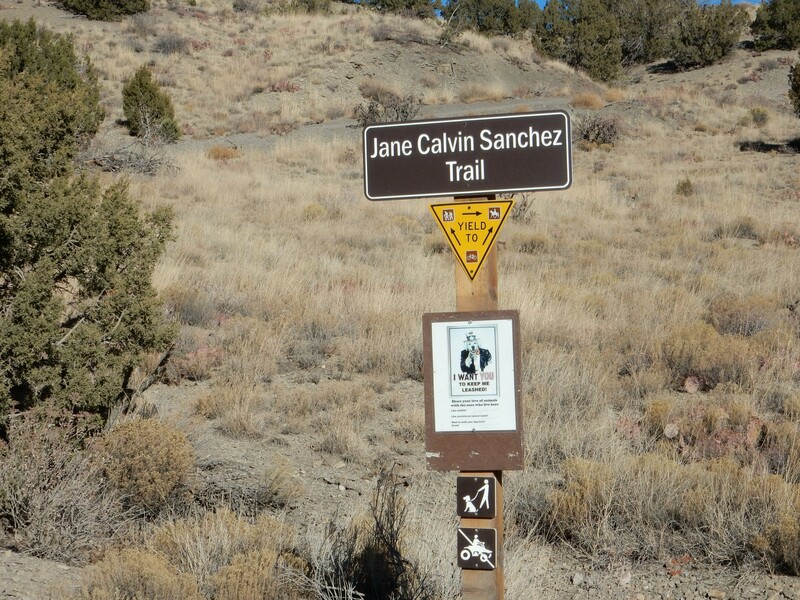 I arrived at Cerillos Hills State Park, put my five quatloos in an envelope at the kiosk and flagged my vehicle with the pass, donned my new “tactical footwear” (I really think that’s Marketspeak for “hiking boots”) and headed for the nearest trailhead. Please to keep your dog on a leash. And please to yield to horses. 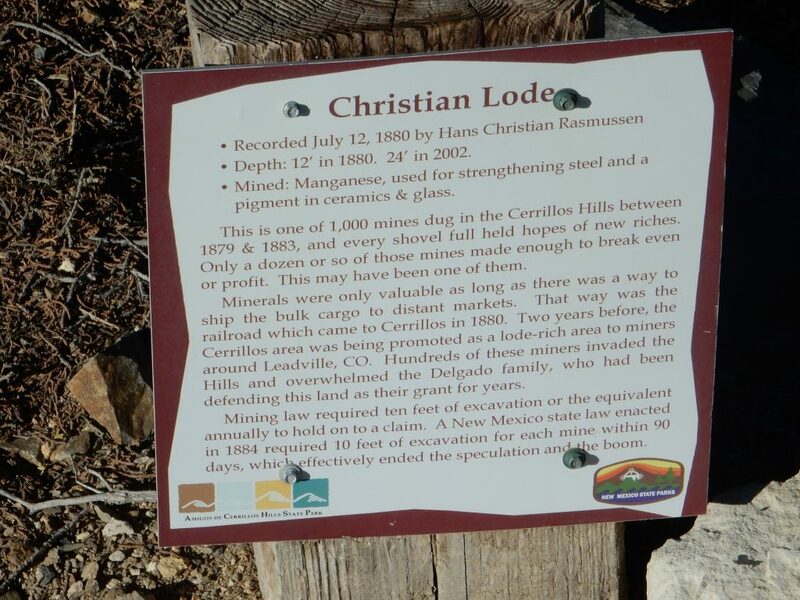 Bruce Rabe and I have been on this trail before, but a second visit lets you pick up more details. This end of the trail is all Mancos shale. At this point, I realized my camera was showing a low battery indicator, and of course I had left the spares in the car. Fortunately I wasn’t far up the trail. I hiked back, grabbed the spare batteries, and resumed. I found it interesting that the local prickly pear cactus turn a pale pink for the winter. I looked for fossils, but they were not numerous. This rock fragment had a few shells. It’s admittedly a stretch to make identification from a few fragments, but these are likely bits of Inoceramus shells — they have the right peculiar dark waxy look, and Inoceramus is so common in the Mancos shale that it’s a good guess just on the odds. As I was bending over this rock to photograph it, a band of tourists on horseback came down the trail down sun of me. The lead horse sensed my presence and abruptly halted, leading its rider (clearly a tour group leader) to comment that something was spooking the horse. I stood up and shouted a cheery greeting and the relieved tour group leader commented that you never know, it could have been a cougar. “Or, with this horse, a rock.” Heh. 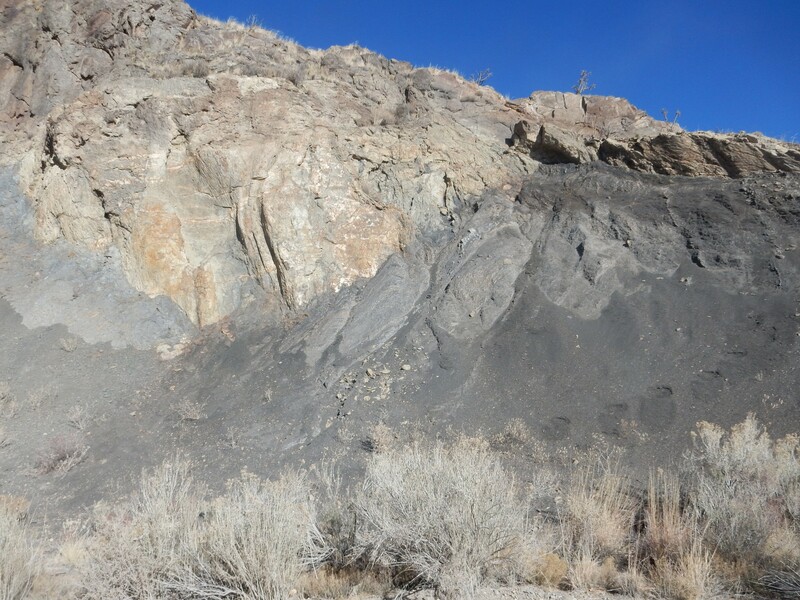 We’re getting close to the Cerillos Hills intrusion here; this shale may be slightly baked. 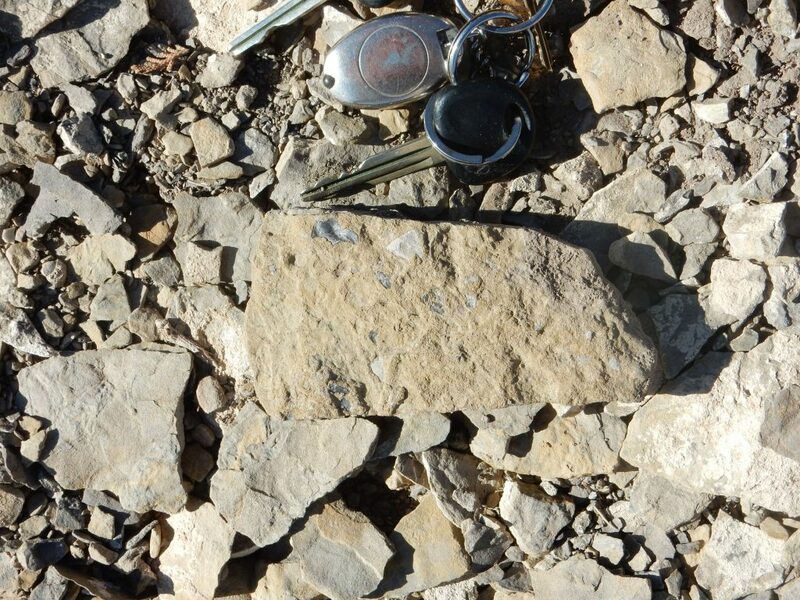 And this shale is definitely hornfelsized. Unaltered shale at right, hornfelsized shale at left. Sure enough, a mine shaft is nearby. A manganese mine, and one of the few in this area that ever turned a profit. Manganese is kind of a funny critter. It is moderately abundant, with manganese oxide typically making up half a percent or so of low-silica volcanic rock. But it is chemically similar enough to iron that it often blends into iron minerals and rarely is concentrated as distinctively manganese minerals. But apparently here. Hans Christian Rasmussen was apparently kind of a funny critter, too. More on that presently. Further up the trail, we leave the Mancos shale and enter the Cerillos intrusion, here composed of andesite porphyry. This is the source of the local ore deposits. The porphry itself does not contain concentrated ore, but as it cooled and solidified, it “sweated” fluids rich in incompatible elements, elements whose atoms do not fit comfortably into the structures of the more common silicate minerals. 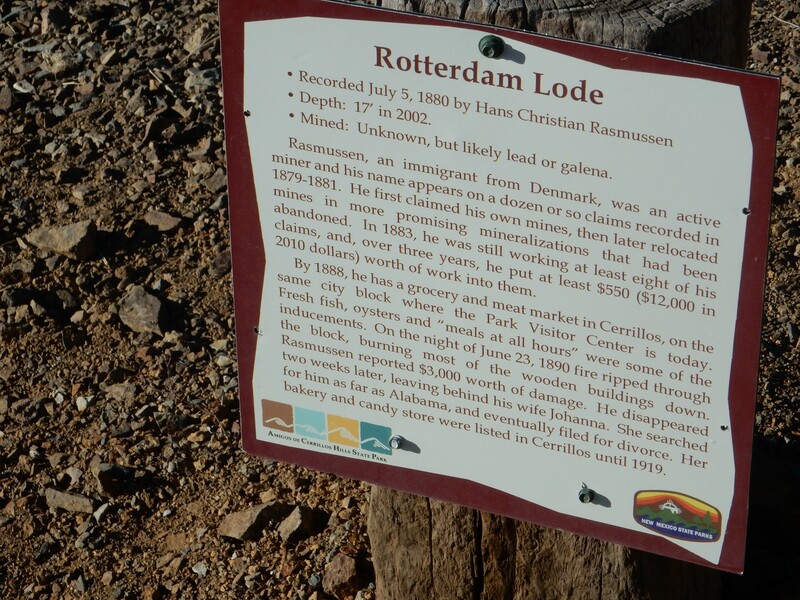 The incompatible elements, which include lead, gold, silver, and copper, became concentrated in the hydrothermal fluids and deposited as fairly rich ore in narrow seams and veins. 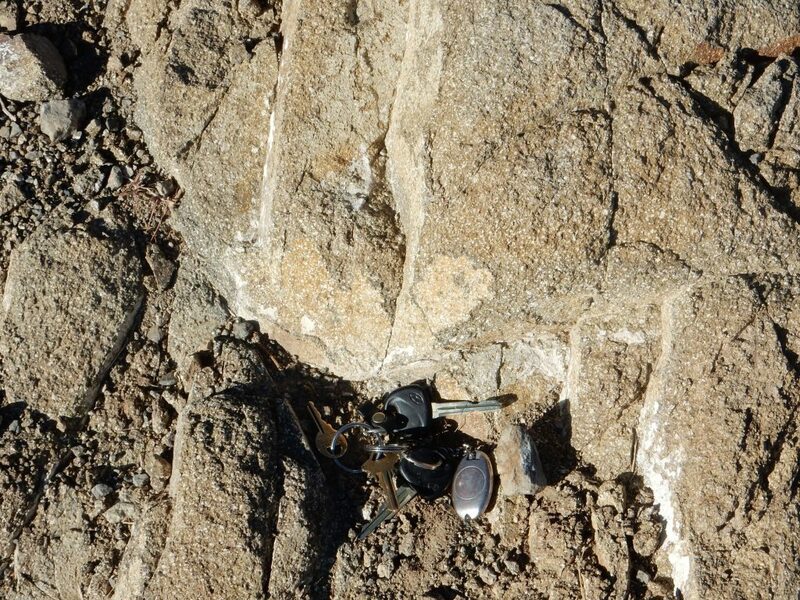 Here is a very tiny “roof pendant” of altered Mancos shale over the andesite porphyry. When an igneous intrusion is exposed by erosion, patches of the overlying “roof” rock are sometimes left intact, and these are called “roof pendants.” Some roof pendants extend for miles. This is a tiny one. How do I know it’s altered Mancos shale? 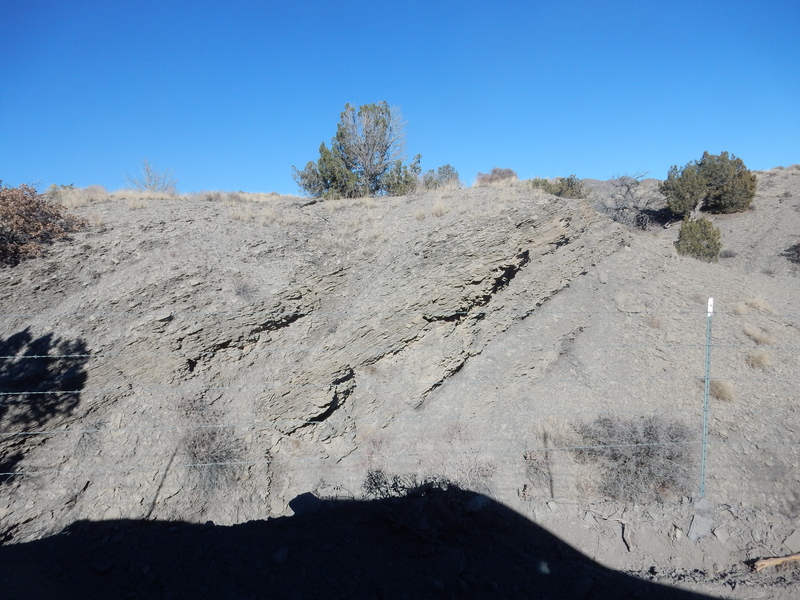 I was able to “walk out the bed” for some distance, and found that it gradually transitioned to unaltered Mancos shale. He seems to have made more money in town than in his mines, and there’s a hint in this story that he may have been an arsonist as well. Though one wonders if foul play was involved in his disappearance. 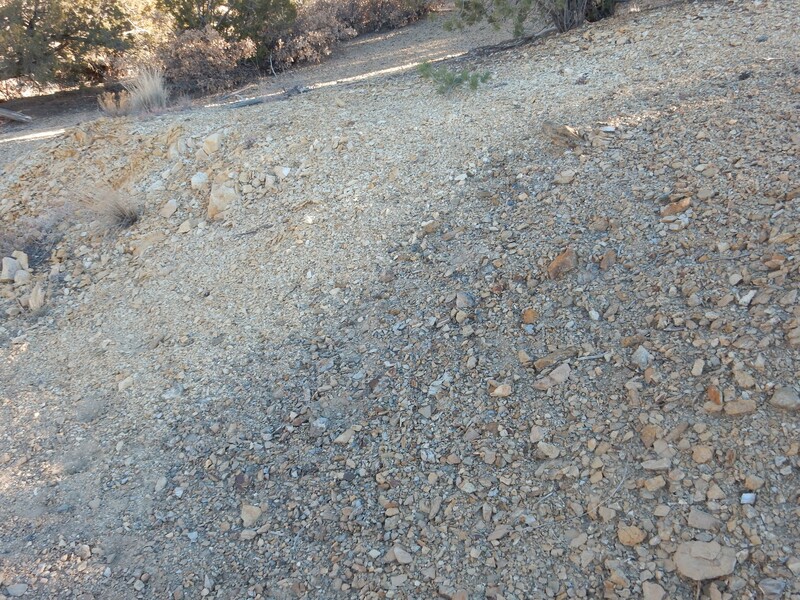 Further up slope is a dike that Bruce Rabe and I puzzled over on our first trip through. The first time I saw this, from this angle, I thought it was a sill, which is a layer of magma that intrudes horizontally between rock layers rather than vertically across them. 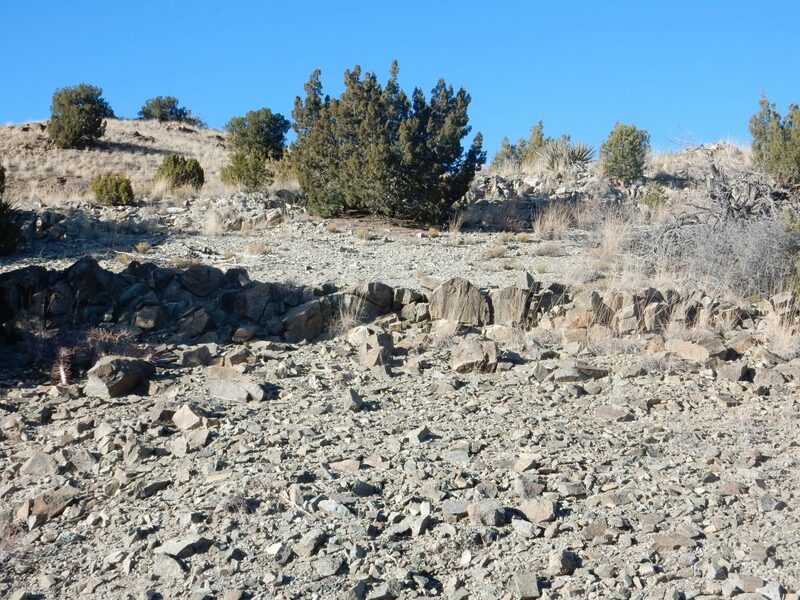 But the host rock here is andesite without any layering, and when I walked further along hte dike, it became clear it was a dike, as shown on the geologic map. The map also identifies this as trachytic latite, a relatively high-silica volcanic rock with a high potassium content. Other than the ground mass being gray instead of pink, this looks a lot like the dike we saw clear back at Galisteo Dam. Color is one of the least reliable features for identifying rock, so I’m thinking the earlier dike was trachytic latite as well. The dike radiates from the Cerillos Hills and almost certainly part of the same eruptive phase as this dike. Time is fleeting, and I hurry along the rest of the trail. I have to stop for this, though. There’s a lot going on here. The dark rock at lower left is definitely altered Mancos shale. The pink stuff at upper right is young sediments. The vertical dark band just left of center is igneous rock — a small dike. But the igneous rock continues to the upper left, with a thin layer between that looks like baked soil. Was this a small eruptive vent? I get back to my car and switch back into my shoes. I like the “tactical footwear” for hiking; they need a bit more breaking in, but they do a wonderful job of supporting my ankles. On the drive out, an impressive river terrace. River terraces form when the level of a river drops, leaving part of its old flood plain “stranded” above the river. There are river terraces all through the Rio Grande Valley, along both the Rio Grande ands its tributaries, indicating that there is continuing regional uplift as the western United States drifts onto the East Pacific Rise, a major upwelling in the Earth’s mantle. This area is known to have been at an altitude of about 1600′ thirty million years ago. It is now near an altitude of 6000′. 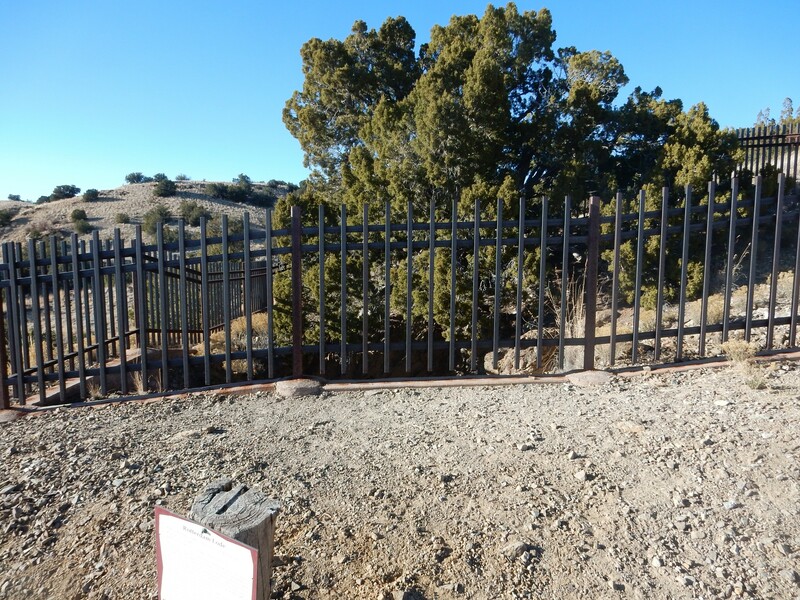 The terrace here is the youngest of six terrace levels that have been mapped by geologists along Galisteo Creek. The top of the ridge is part of the Ortiz surface and is paved with Tuerto Gravel. The yellowish beds below are mostly lower Galisteo Formation, a Tertiary formation going back around 30 million years. These beds mostly dip to the left. However, there is a thin yellow bed at top, just below the gravel, that is nearly horizontal; this is much younger Ancha Formation. Or so I read my geologic map. 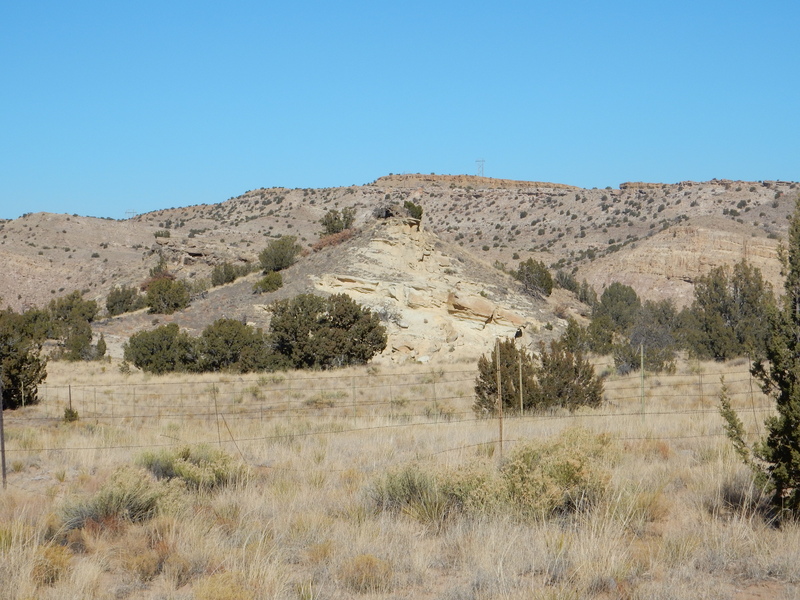 Off in the distance to the east, the Ancha beds are a more distinctive red resting on the Galisteo Formation. I start for home. On the way back, I decided to stop at Trader Joe’s in Santa Fe to celebrate. They sometimes have lychees, which Cindy developed a fondness for while serving as a Mormon missionary in Taiwan, but not today. They also sometimes have some specialty seed bread I like, but, again, not today. But at least they had the surprisingly inexpensive Roquefort cheese I like, and fresh edmame. They also had flowers. I started to grab a bunch of cut alstroemerias for Cindy, but saw that they had live orchids at a good price. It amazes me how inexpensive orchids have become; I understand that this is due to advances in tissue culture, of all things, which is apparently how they propagate them so cheaply. I grabbed a lovely peppermint phalaenopsis. Alas, when I got home, Cindy looked at it mournfully and informed me that Spartacus, my daughter’s cat, would devour it. I had not realized the furball had developed a taste for tropical vegetation. Well, shucks, and other comments. Fortunately, have found it a good home. 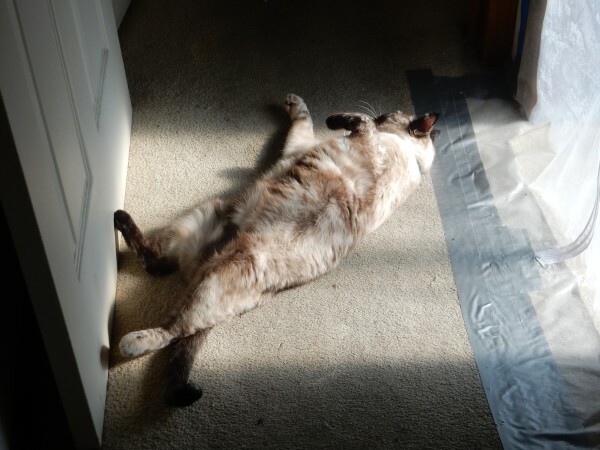 Notwithstanding the orchid-devouring cat, it was not a bad day at all. I am getting cabin fever. If you can come down before we get any more snow, I have a Tusas Mountains log that looks pretty interesting. Almost all will be new ground for me. Mostly basement geology, rather than sedimentary, though. Glad to see you back out in the field. Phil, I see from your linked profile that you do hydrogeology for LANL. It may amuse you to know that my sole formal qualification in geology is a hydrological modeling certification from USGS, and my sole professional experience is developing some modeling codes to interpret laboratory hydrological flow experiments for the WIPP certification. All quite a few years ago.